This delicious Havana boasts flowery, woody and sweet aromas, characterized above all by its freshness. Extremely rich, This cigar is layered with stronger, spicy tobacco. Coffee, vanilla, cocoa and cedar flavors 'melange', creating an intriguingly long, smooth smoke on the palate. Shorter in length than the more famous Lanceros, this cigar offers a shorter alternative with the same flavors. This cigar has limitless aging potential. A true connoisseur's cigar. Like his elder, the Lanceros, it delivers a lot of cedar-spicy notes. Dark honey notes with a gentle earthiness. We notice that it was less round smoke than the Lanceros. The difference we believe is due to the shape. The second third is marked by a woody spiciness. It's spicy, with rare hints of cocoa and roasted nuts. Our advice: control the draw, otherwise, you will have a nervous finale. 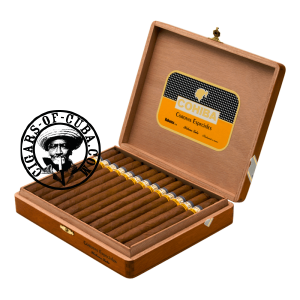 It's daily cigar for connoisseurs and a classic elegant after dinner Havana for beginners.